Our very popular range of Geoptik Hermetic cases are now back in stock at Rother Valley Optics. There are 3 sizes in the Hermetic range. The 340, 540 and the 8" SCT. Click here to see the 340, click here to see the 574 and click here to see the 8" SCT case on our website. The smallest is perfect for small tracking mounts such as the Star Adventurer bundle, but also doubles up as an accessory case for those delicate eyepieces and filters. The largest case is ideal to store larger accessories such as mounts etc. 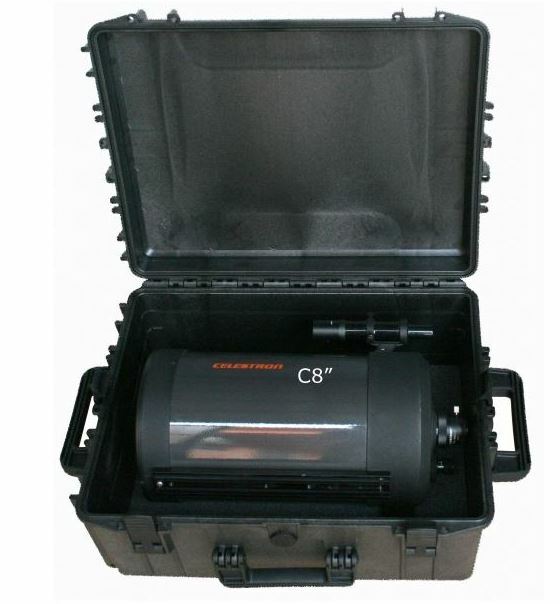 The case also is a perfect fit for 8" SCT telescopes such as the Celestron or Meade. All these cases come with complete foam kits which are diecut so you can pull them out to make your own shape to suit your individual equipment. All these cases are fully dust and waterproof with an automatic pressure release valve. Check them out on the website today!